St. Joseph Oratory vicar Canon Adrian Sequeira leads the St. Joseph Day procession down Gratiot Avenue as members of St. Joseph Oratory carry a statue of St. Joseph and banners from the parish. Cars were stopped, people began staring and cellphones were pulled out to snap a quick pic, as it was St. Joseph who had the right-of-way on March 19. 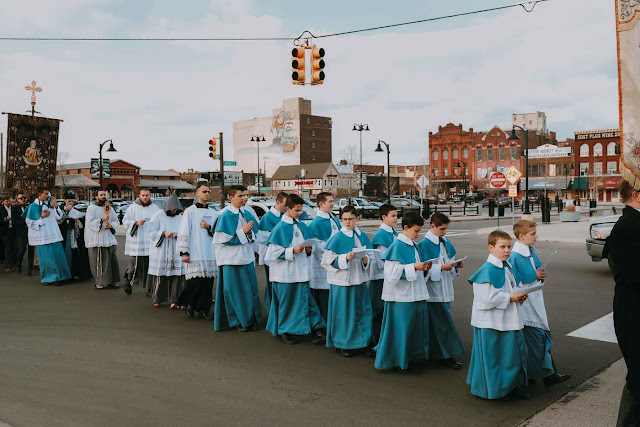 With St. Joseph vicar Canon Adrian Sequeira, ICRSS, leading the procession and parish pastor Canon Michael Stein, ICRSS, chanting the rosary, the parish community made its way down Gratiot and Russell to Shed 2 of Eastern Market. The procession was part of a full schedule of events at the parish, including Masses in the morning, noon and evening, confessions all day, a guided church tour, an Italian dinner and an organ recital. With people in and out of the parish for most of the day, St. Joseph parishioners were on call as volunteer ushers, cooks and hostesses for the Italian dinner.